HILLSBOROUGH, NC (Orange) – Multiple fire crews responded to a large fire near Nash and Calvin Streets Friday around 5 p.m. to the former Bellevue Manufacturing Company textile mill at 202 S. Nash Street in Hillsborough, police said. The Memorial Service will be held at the Forest Hills Baptist Church in Charlotte on Saturday, May 7 commencing at 12:00pm. PINEVILLE, NC (Mecklenburg) – A Pineville firefighter died while battling a fire at a one-story commercial strip shopping center Saturday night. We are developing a new FireNews.net for you. Thanks for your patience. 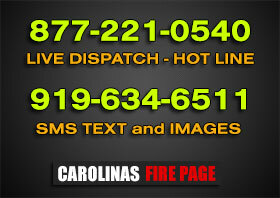 Follow us @FireNews and @CFPalerts for the latest news and emergency images. FireNews was started in 2003. We invite your submissions. © 2017 Copyright Sendigo theme. All Rights reserved.